← What Does It Mean To “Curate”? Jules Chéret, (French, 1836–1932), L’Horloge: Les Girard, 1875/1878 or 1880/1881. Color lithograph. Collection of Jim and Sue Wiechmann. Photo by John R. Glembin. Even though the exhibition Posters of Paris: Toulouse-Lautrec & His Contemporaries may be billed as a fine art retrospective, it also serves as the largest and most extensive graphic design exhibition Milwaukee has ever seen. 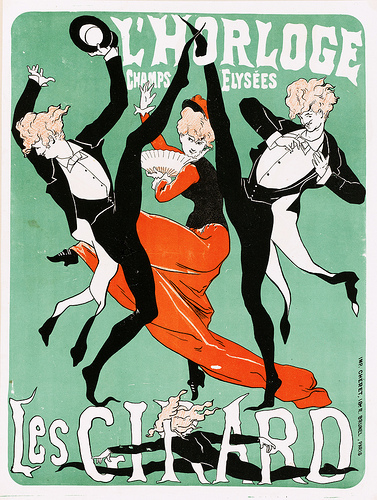 Featuring posters from the turn of the 20th century, Posters of Paris hearkens back to the roots of the profession. The artworks are situated at a time before “graphic design” was a legitimate term, but well after the world started recognizing the power of arresting visual communication. And the line-up curator Mary Weaver Chapin has pulled together is impressive. The exhibition includes works by who I’d call the godheads of posters–Jules Chéret and Henri de Toulouse-Lautrec to Leonetto Cappiello and Alphonse Mucha. For a casual observer, or a trained graphic designer, there’s no shortage of exuberant eye candy to indulge in. 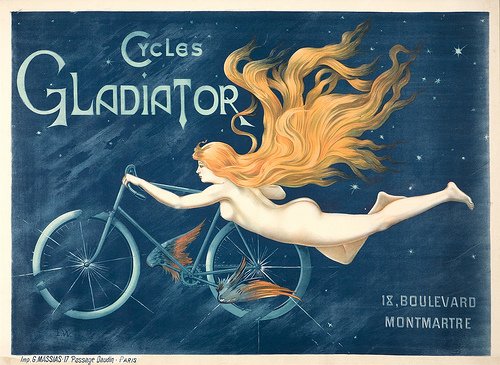 Posters of Paris will likely leave you drooling for days. These larger-than-life posters were originally praised for their stark and enchanting imagery, made accessible to all. They ushered in the era of the “open-air museum,” free from the bureaucracy of the art world (which was still caked in centuries of dust and antiquated thinking). This new culture was largely born out of the invention of lithography by Alois Senefelder (German, 1771-1834). Invented in 1796-99, the new technique offered a wide range of shape, color, and size variations previously unavailable to artists. And not only did the medium offer new formal possibilities, but it also spoke to the new democratic aspects of mass production. Henri de Toulouse-Lautrec, (French, 1864–1901), Divan Japonais, 1893. Color lithograph. Milwaukee Art Museum, Gift of Mrs. Harry Lynde Bradley. Photo by Larry Sanders. With lithography, pop culture was born. For brief visual moments manifested on public posts around the city, highbrow and lowbrow were one. 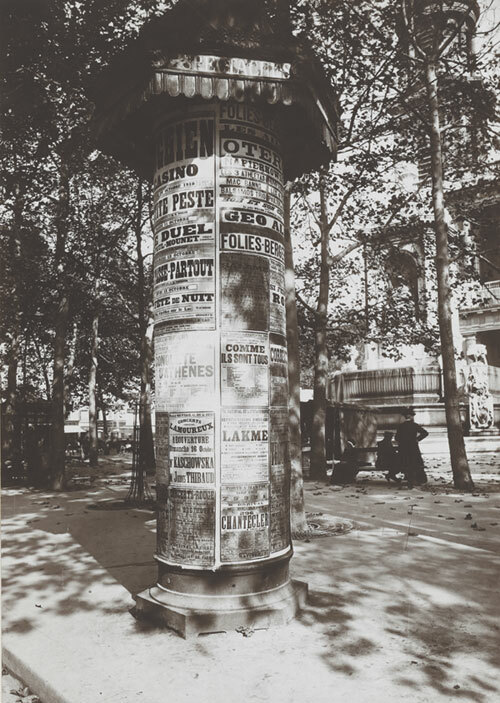 A “Morris column” showing posters on the streets of turn-of-the-century Paris. The language of the street became the language of everyone. And, woof, was it a beautiful one! While you’re making your way through the exhibition, look closely – if the images themselves aren’t enough to make you black out in amazement, there’s an unbelievable amount of tasty typography to sink your teeth into as well. These were the days before corporate branding strategies and rigid identity standards, so there were few restrictions on the range of typographic experimentation the artists could dabble in, even among posters for the same brand. In particular, spend some time with the work of Georges de Feure or Ernest Kalas and their luscious lettering (the custom typography used in the exhibition companion catalog, designed by Hal Kugeler, was based on Kalas’s Exposition d’affiches artistiques poster of 1896). Not to say these posters didn’t benefit from the kinds of standards the world of advertising upholds today – take, for example, Cappiello’s poster Chocolat Klaus (1903) below. In comparison to the heavily ornamented works of his contemporaries produced only a few years earlier, Cappiello’s work looks restrained, modern, and on point with the public’s maturing aesthetic taste. Leonetto Cappiello, (Italian, 1875–1942, active in France), Chocolat Klaus, 1903. Color lithograph. The Rennert Collection, New York City. Image courtesy of Jack Rennert, New York. This poster was no exception to Cappiello’s signature style, bringing the attention to a solitary focal point–in this case a smiling woman in a flowing green dress riding a bright red horse surrounded by nothing but black space and text. 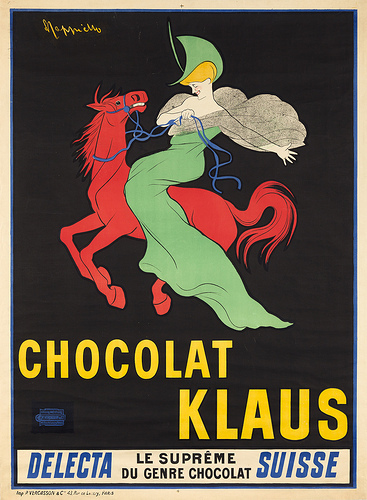 The poster promoted a Swiss brand of chocolate under the name of Klaus. Curiously enough, save for the text describing the chocolate, Cappiello’s illustration was completely devoid of any ties to the actual product. This didn’t seem to bother consumers though, or Klaus for that matter. In fact, the distinct image Cappiello illustrated became so iconic that customers started asking for “Red Horse Chocolate,” a name that stuck for years afterward. Tangible links were being revealed between sales and promotion. In the early 1900s, posters began to fall out of public favor. Many of the most famous artists were either dying or moving on to other interests. Those that saw the poster as a revolutionary symbol of equality for all were growing disenfranchised; they had hoped that the rise of the poster would liberate art from the old world’s grip and place it in the hands of the people. Instead, they saw the poster as serving an altogether different purpose, as “part of a new, highly commercialized industrial world in which it served ends completely different from the ones the reformers had expected,” as historian Miriam Levin explains. Advertisements started contributing to a media overload, flooding the streets with unwanted and invasive messages (on your way out of the exhibit before entering the store, pay attention to the large photo of a street in Paris covered with advertisements – strikingly similar to some of our own modern-day street scenes, no?). It’s hard to say whether these posters would be so highly regarded today if not for their distinct visual style and the incredible craft present in their reproduction. Sure, they may serve as excellent visual markers of advertising’s increasing presence in everyday life, but the reason they are so beloved and the reason they’ve found their way into an exhibition at the Milwaukee Art Museum is because of their status as incredible and enchanting art objects. This seems like an opportune moment to consider the ways in which modern day creators are impacting our visual landscape. Unknown (L.W. ), Cycles Gladiator, ca. 1895. Color lithograph. Private Collection, Potomac, MD. Image courtesy of Jack Rennert, New York. So I ask: Graphic designers, will our work be featured in a floating art museum 100 years from now, or will it get lost amidst the haze of the past? Are we creating memorable and important artifacts for the future or just more fodder for the landfills? Is our work offering an “open-air museum” to those who frequent our public spaces or just adding to the mindless visual clutter we’re bombarded with every day? What is our contribution to the future of visual audacity? 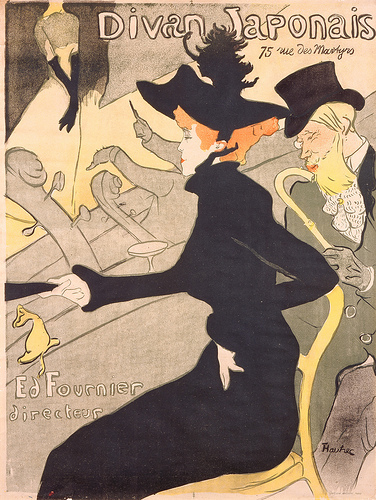 Questions to consider while marveling at the works in Posters of Paris: Toulouse-Lautrec & His Contemporaries, on view in the Museum’s Baker/Rowland Gallery until September 9, 2012. Be sure to check out the exhibition catalog for more information and commentary on this intriguing era of design history. This entry was posted in Art, Curatorial, Exhibitions and tagged Alois Senefelder, Alphonse Mucha, Ernest Kalas, European Design, Exhibitions, French Art, Georges de Feur, Henri de Toulouse-Lautrec, Jules Chére, Leonetto Cappiello, Paris, Posters of Paris, prints. Bookmark the permalink.